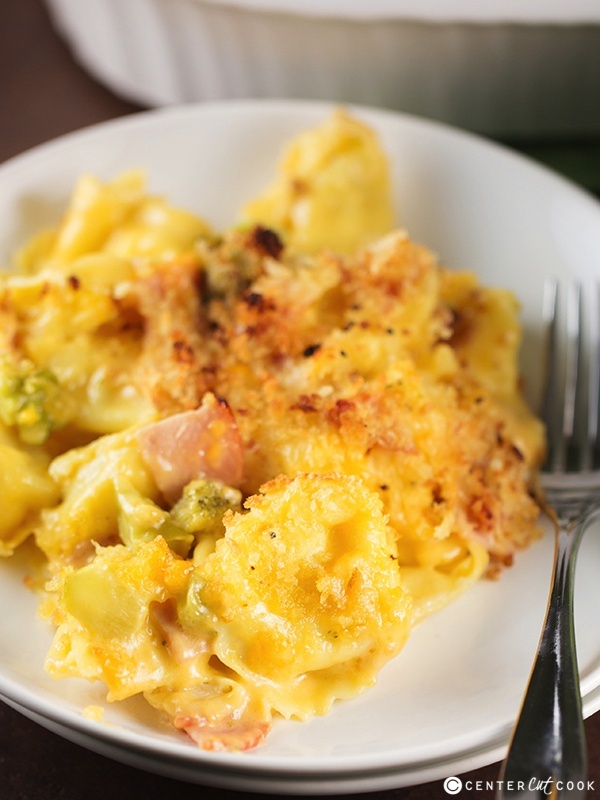 Cheesy Tortellini Bake with lots of cheese, ham, broccoli and a crunchy topping, baked until golden brown and delicious! 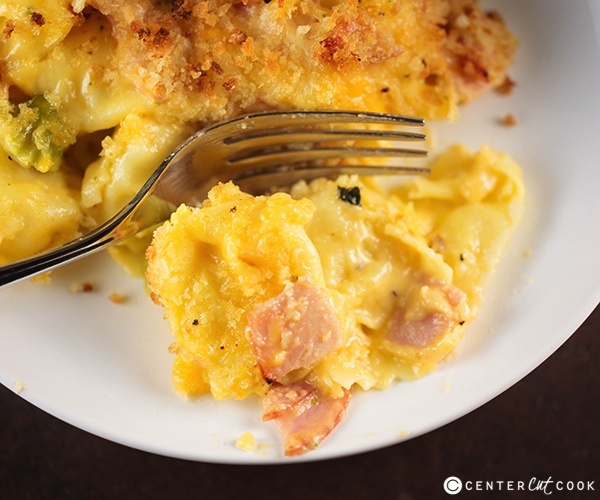 This Cheesy Tortellini Bake is one of those recipes that came to be after I was trying to figure out how to use ingredients I already had in the house. 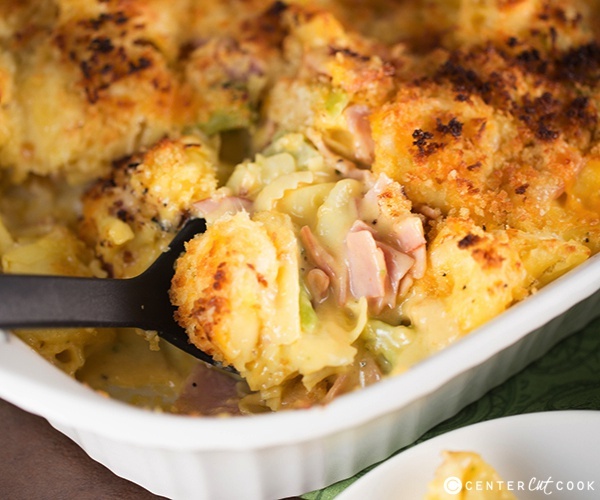 With a package of tortellini, lots of cheese, a pound of ham, and some broccoli just waiting to be used, I decided to make this Cheesy Tortellini Bake with a super crunchy topping. It’s just perfect for a hearty, satisfying family-pleasing meal. Just look at that crunchy topping! I used panko bread crumbs to get the extra crunch, combined with a little butter. 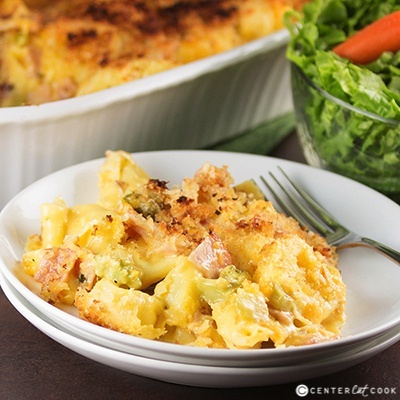 It’s the perfect topping for this Cheesy Tortellini Bake! Because I had ham and broccoli already on hand, that’s what I used, but feel free to leave those ingredients out altogether if you wish, or you could sub in some of your favorites; bacon, scallions, chicken, peas. So many options! I used cheese tortellini but feel free to use whatever kind of tortellini you’d like. Mushroom tortellini is another yummy alternative. The sauce comes together in just a few minutes, and because the tortellini literally only take a couple of minutes to cook, the hands-on time with this recipe is pretty minimal. May I suggest grating your own cheese? You will get the best melty, ooey gooey cheesy result if you shred your own cheese versus buying the pre-shredded cheese from the grocery store. Is there anything not to love about cheesy tortellini with more cheese and a crunchy topping? I assure you, this is a meal the whole family will love! Enjoy! And in case you have some leftover tortellini, this Tortellini Soup is to die for! Melt 4 tablespoons butter over medium heat in a large non-stick skillet. When the butter has melted, add in the flour and whisk really well. Allow this mixture to cook for a few minutes. It’ll be a pasty consistency. Slowly add in the heavy cream and whisk well. Gradually add in the milk, continuing to whisk really well to remove any clumps. Reduce the heat to low and begin to slow add in 2 cups of smoked gouda and eventually 2 cups sharp cheddar cheese. Stir in cooked ham and cooked broccoli. Pour the cheese sauce over the cooked tortellini. Grease a large casserole dish ( I used my 9 x 13 inch casserole dish) and pour the tortellini and cheese mixture into the dish. In a small bowl combine 3 tablespoons melted butter with 3/4 cup panko bread crumbs. 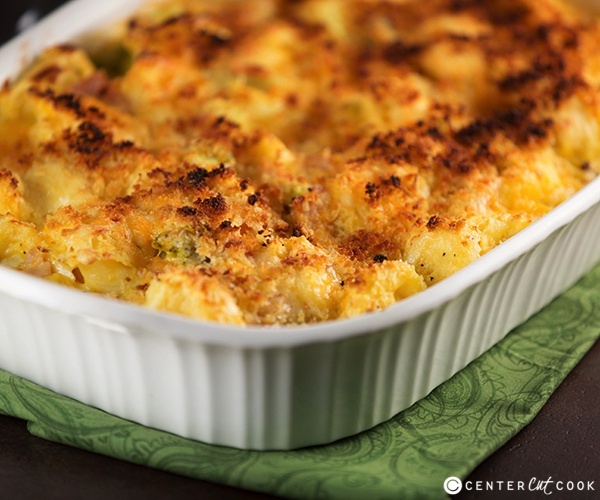 Sprinkle the remaining 1/4 cup of gouda and 1/4 cup of cheddar over the casserole. Sprinkle the bread crumb mixture over the top of the casserole. Bake for 25-30 minutes, then broil for a few minutes until the panko bread crumb topping is golden brown. Allow to cool for a few minutes before serving.